So much to celebrate! It’s been a busy and wonderful few months filled with exciting events and achievements. All these big moments can only mean one thing: CHAMPAGNE! I love me some Champers! I love all kinds. I love the blancs, the noirs, the rosés. Bring on the bubbly I say! And while I love sparklers from all over the world, there’s just not quite anything else like Champagne. Perhaps it’s the mystique of the region . . . but I dunno . . . there’s just something extra special about Champagne. I must admit that I sometimes get a bit frustrated with friends that exclusively reach for the bottle with the yellow label. (Some of my very best friends fall into this camp.) I don’t have anything against it per say – in fact I have ample respect. Madame Barbe-NicoleClicquot Ponsardin was one amazingly badass boss lady. However, I do tend to think that people often get stuck on the yellow label and never move on when there’s a whole beautiful, sparkly world to discover. Before we move get to some of these recent Champagne moments, there are a few facts and terms that are useful to know when exploring the range of styles. First, of all: Champagne must come from Champagne. Champagne is a region in northeastern France and to proudly wear the name “Champagne” it must come from this region. Everything else is sparkling wine, bubbly, bubblers, fizz . . . whatever you want, but not Champagne. There are three predominant grapes used in Champagne: Chardonnay, Pinot Noir, and Pinot Meunier. Pinot Blanc, Pinot Gris, Petit Meslier and Arbane are also allowed, but are much, much less common. Blanc de Blancs - “White from white.” These are made completely of white grapes, and more often than not that’s Chardonnay. Blanc de Noirs - “White from black.” These wines are made from black grapes, typically Pinot Noir and Pinot Meunier. The juice is pressed away from the skins quickly, so that juice doesn’t get any color. Rosé - I think we all know this one and of course you don’t the label to tell you the wine is pink. This can be a blend of grapes. While it’s unusual for other types of rosés, a Champagne rosé is often a blend of white and red wine to create a pink wine prior to secondary fermentation. Some producers also use the saignée method. There are also several types of Champagne producers, and knowing these is helpful in exploring some the most exciting stuff going on in the region. Like anywhere else, there are big guys and little in Champagne. This might not be as readily evident here, because the big players have such a long, established, and storied history in the region. Historically speaking, they’ve dominated the landscape because the traditional model has been that the big houses, sometimes referred to as Grandes Marques, buy up grapes from many small growers to use to make blends in their house style. However, small producers do make wines from their own grapes as well, and this is a trend that is gaining steam. More and more wines from these little guys are making their way over to the US and are increasingly available. These wines represent a more artisinal take on Champagne. Since these producers are working with their own grapes, they have less material to go into making a blend, so almost by default these wines are more site specific. They might also not have as much reserve wine to keep on hand stored up from various vintages for a base blend as the big houses, so even their Non-Vintage (NV) blends will likely be made up of predominantly one vintage, even if it’s not labeled as a vintage cuvée. NM (Négociant Manipulant): A house that purchases grapes and or base wines from growers and other smaller houses. Some NM houses own a significant portion of their own vineyards; others own none at all. Large Champagne houses with the most international presence are invariably in this category: Moët et Chandon, Louis Roederer, Veuve Clicquot Ponsardin, Billecart-Salmon, Lanson, Taittinger, Pol Roger, Perrier-Jouët, Mumm, and Laurent-Perrier. Quality varies widely, although prices are uniformly high. Many houses often fall under the same corporate parentage; for example, Moët et Chandon, Krug, Veuve Clicquot Ponsardin, and Mercier fall under the umbrella of the luxury conglomerate LVMH. RM (Récoltant Manipulant): A grower-producer who makes Champagne from estate-grown fruit. 95% of the grapes must originate in the producer’s own vineyards. I like all kinds and drink Champagne from both big producers and small. There are pluses and minuses to both. The Grandes Marques are more likely to be consistent, so once you know you like a house’s style, you can pretty reliably continue to return to that wine year after year. They know what they’re doing and they’ve got it dialed in. The smaller producers will show more variation from year to year, can be more quirky, and are more likely to be terroir-driven. In broad strokes, they’re more reflective of their time and place. Personally, I also really like supporting the little guys when I can. You’ll see too from the wines below, that sometimes lines get fuzzy. In the wines in today’s line up, two wines are are from Grandes Marques, two are from RM’s, and two are from small NM’s that kind of straddle the line. Greg and I also enjoyed a grower-producer Champers for our Anniversary this year. Read about that one, on the Big 10, Champagne, Burgundy,and #OTBN. There is a ton more information you can take away from a Champagne label, but at the risk of overload, we’ll leave it here for today. Now let’s move onto recent Champagne moments! These toasts all occurred over the last month, which goes to show what kind of month it’s been. Sam, Sarah, and I were setting up well into the evening the night before the event. 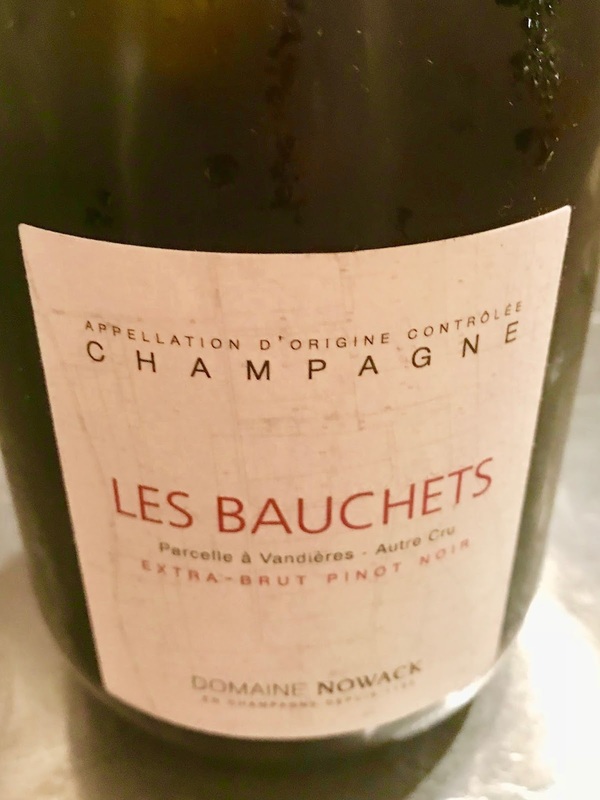 After a long, hot day, Sam popped open a bottle of Domaine Nowack Les Bauchets Pinot Noir Extra Brut Champagne NV. To be honest, I was so tired that I did not really process what the wine tasted like. I certainly wasn’t in a state to dissect tasting notes. All the same, this grower-Champagne was soooooo good just then. SO refreshing. There are two Nowack brothers, Frederic and Flavien, each making their own wines from vines planted by their father, Bernard. Frederic’s are under the Champagne Nowack banner, and Flavien’s bear the name Domaine Nowack. This is one of Flavien’s. Both are produced with sustainable and biodynamic principles, with a philosophy “to understand the complex ecosystem of each parcel of our vineyards in order to respect it”. Flavien made his first vintage in 2012 and the Bauchets was the first Champagne he made. 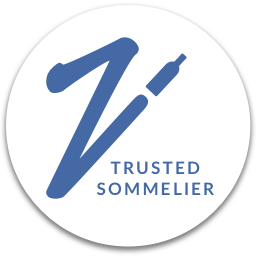 On their site, he says he wanted “to produce a wine with the minimum possible intervention and one that would display the true characteristics of the Pinot Noir grown in the Marne Valley.” The grapes for this wine come from vineyard plot in Vandières in the Marne Valley, with a south-easterly facing aspect located at mid-slope on very sandy soil. The vines were planted in 1983. Aging: 36 months on the lees. It was a wonderful day! After months of planning a big event, one wonders and worries that it will all turn out as you hoped. It did! It was a really positive and inspiring event. You can listen in on all ofthe panels here. After everyone had gone home and we’d broken down the site, our team of four went out to celebrate. We had a beautiful meal at Torc in downtown Napa, along with some pretty killer wine. Still, bubbles seemed necessary. Sometimes when you’re working in the moment, you don’t really fully appreciate the work that is being accomplished. 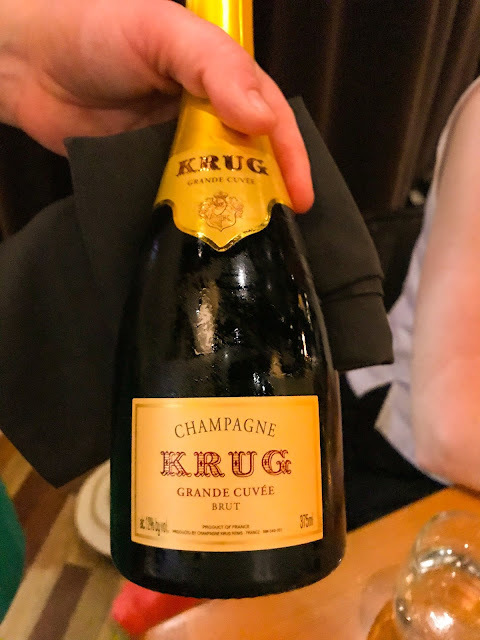 At dinner, the feeling began to set it that, as Sarah put it, “we did a thing, Y’all!” She ordered a half-bottle of Krug Grande Cuvée Brut Champagne NV for the table to cap off the evening. Just enough for us each to have a splash. Krug is my favorite Grande Marque! The house style is rich and toasty, and just feels luxurious. The prices match. (The average price for a full bottle is $182.) I sadly do not got the chance to have it often, but I relish the opportunity when it presents itself. This wine tends to have notes of baked spiced apples, meyer lemons, brioche, nuts and spice. It’s rich but elegant. The house was established in Reims in 1843 by Joseph Krug. He’d immigrated from Germany and worked at Jacquesson as an accountant for ten years before starting his own house. Today it under the LVMH banner, like several of the other famed Grandes Marques. However, Olivier Krug, a sixth generation member of the family, directs the house. Krug has 50 acres of their own vines, then sources the rest of their fruit through long-term contracts. Every parcel that is brought in is fermented separately in neutral, 205-liter barrels. The Grande Cuvée Brut is blended from over a blend of around 120 wines from ten or more different vintages and includes Pinot Noir, Pinot Meunier, and Chardonnay. It is aged for a minimum of six years before release. Let the good times roll. The next evening, our friend Drew , true to form, contrived a rather decadent evening. 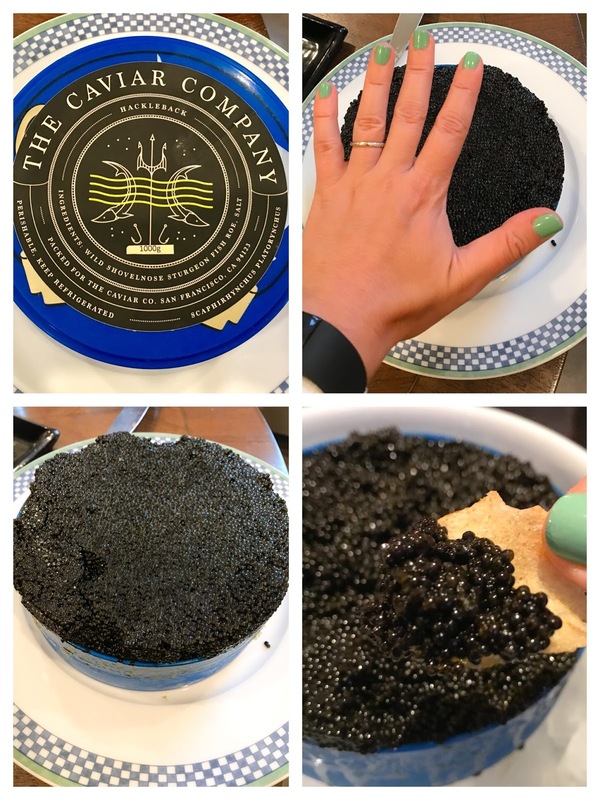 He’d managed to get an excellent deal on a sh*t-ton of caviar! The entire night was organized around the mission of eating it all. We succeeded. The group required a few bottles to wash things down. Among them were two bottles of Champers. 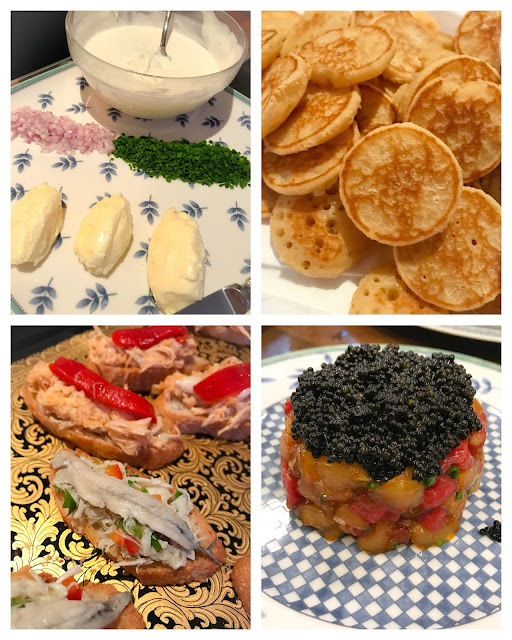 Caviar and Champagne are a classic pairing after all! The bottles happened to be split between a Grande Marque and a grower champs––Taittinger Brut Champagne NV and Leclerc-Briant Extra Brut Champagne 2009. The Taittinger was lovely, but it was the Leclerc-Briant that really caught the group’s attention. Photo borrowed from their site. 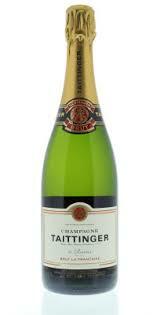 Taittinger’s history goes back to the 1700’s, but it was purchased by Pierre Taittinger in the 1930’s. It’s still owned by the family–very unusual amongst the Grandes Marques–under the control of Pierre-Emmanuel Taittinger. (It was outside family control for a hot second in the 2005, but it was quickly bought back.) The house own about 750 acres of vineyards, which supplies about 50% of its fruit. Their entry level cuvée is usually a blend of about 40% Chardonnay, and a mix of the two Pinots make up the rest. It’s aged on the lees for about four years. The wine tends to be crisp and minerally, on the lighter side, but with hints of smoke and toast. The fruit tends towards apples and citrus with a few berries mixed in. Average price is about $48. Leclerc-Briant kind of straddles the line between NM and RM. It was founded by Lucien Leclerc in 1872, then in 1955 Bertrand Leclerc married Jacqueline Briant, leading to the present name. While it was founded as and still is technically a négociant, the house uses predominantly its own fruit. It holds long term contracts with another 8 hectares of vineyards–a very small percentage overall. The house was an early adopter of organic farming practices in the region in the 1960’s. Bertrand and Jacqueline’s son Pascal took things to the next level and began incorporating biodynamic practices in the 1980’s, and the vineyards they source from are biodynamically farmed as well. The house has been Demeter certified since 2003. Vintage 2009 is made up 40% Chardonnay, 40% Pinot Noir, and 20% Pinot Meunier. The wine was fermented and aged for 7-8 months in stainless steel and cement tanks is followed by 80-100 months in bottle sur lattes. (More details on the winemaking here.) The dosage is kept low, and the wine is bone dry with just 4 grams per liter of residual sugar. Nonetheless, the wine showed rich character and ripe fruit notes. Leclerc Briant notes that they intend their Champagnes to be food wines that can pair well with many foods, including more full-flavored dishes and I can absolutely see that. With an average price of $59, I think is a great value for vintage Champagne. Some of my wine friends got together for a tasting exploration of Pinot Meunier, the least known of Champagne’s main trio. The tasting focused predominantly on still wines, but we did have one Champagne and it was made from 100% Pinot Meunier. Lelarge-Pugeot is in its eighth generation and is currently run by husband and wife team, Dominque and Dominque. They manage the winery with their three children–everyone has their own role to play in the business. The family began converting to organic and then biodynamic practices in 1985, and 2012 was their first 100% certified organic harvest. Their horses Ursulle and Samba plow the vineyards as it’s more gentle on the land and helps to boost soil health. The winery is located in the village of Vrigny and they have just over 20 acres of vineyards spread over three communes. Soils are classic chalk and clay loam on gently rolling hills at altitudes around 400 feet. 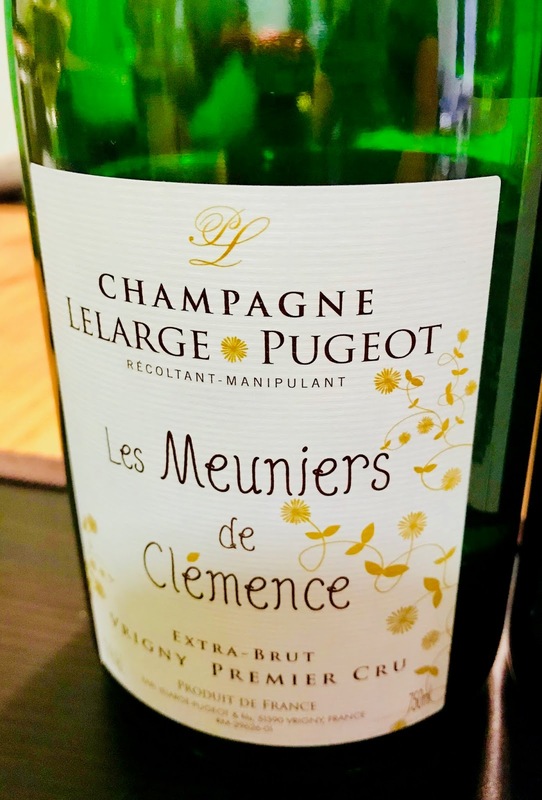 Pinot Meunier grape represents 60% of the family’s plantings and Les Meuniers de Clémence Premier Cru Extra Brut puts it in the spotlight. Seeing as it was a tasting group session, I have tasting notes: Ripe papaya burnt sugar, almond paste, baked apple. Textured on the palate, with a bit of salt, rich but finished crisp and elegant. My birthday was this week. However, I fully believe in celebrating for at least a week. . . . AT LEAST. 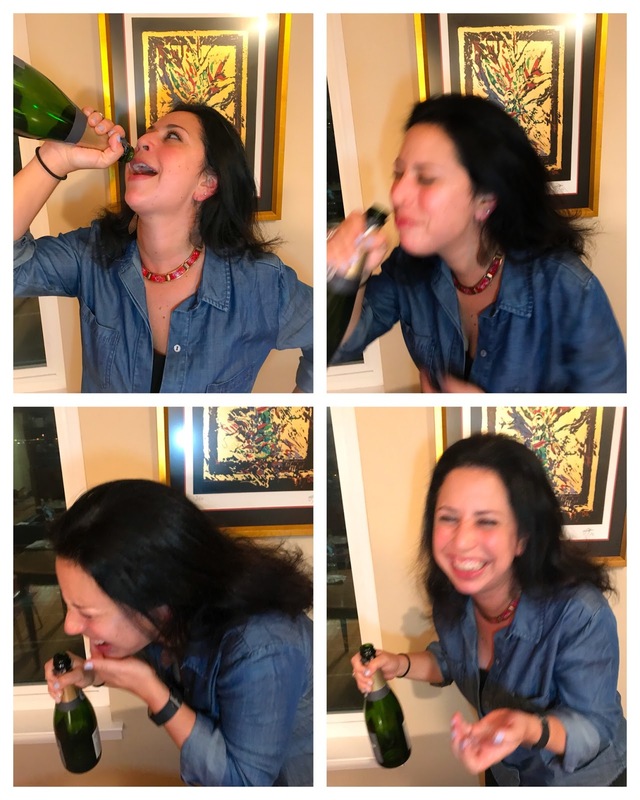 Last week, I had a group of friends over for dinner, and since my birthday was just around the corner, I popped open a bottle of Champs to kick things off. 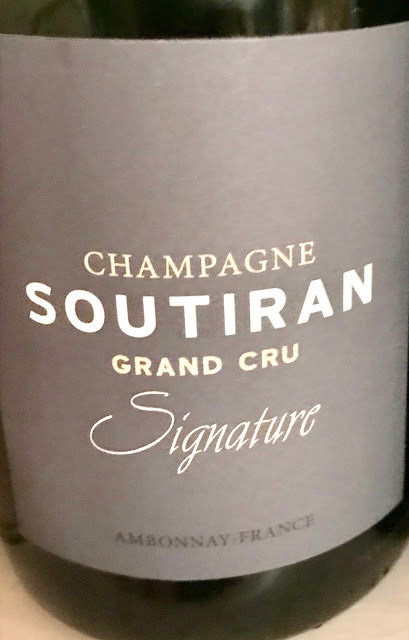 This Soutiran Signature Grand Cru Brut NV has been a favorite of mine amongst those we carry at the store. It has a lot of the toasty richness of Krug, but at a much more friendly price point. ($55-ish) I get the fruitiness of Pinot Noir up front on this one, but it finishes with Chardonnay’s mineraltiy. 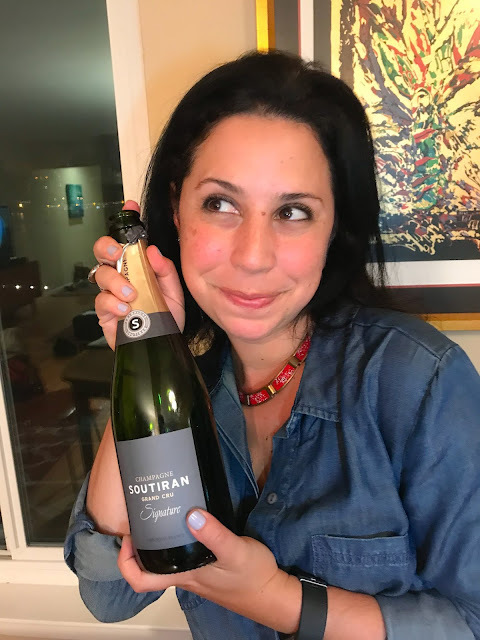 Champagne Soutiran is another house that straddles the NM/RM line. Patrick and Valerie Renaux are the third generation to run the domaine. They cultivate 6 hectares of their own. But also buy grapes from their neighbor growers. Their holding are in Ambonnay with chalky soils complemented by a high degree of silica. There has been quite the string of toast-worthy events. However, I really don’t think we need to always wait for “an event” to pop open a bottle of Champagne. Every now and again, it’s really nice to open one up just because. Champagne is also an excellent food wine. It goes with pretty much everything! So with that, I wish you many Champagne moments. I think I’ll take my own advice on this one and open another bottle or two this week. After all, birthday week continues! Okay...so much great info here. First though I want to congratulate you on a successful Bâtonnage Forum. The bits of information I saw on this were great and I look forward to digging deep into your links for more details. Next...I am so interested in your Pinot Meunier tasting. I fell for the Pinot Meunier Champagne I had at a recent tasting and am ready to dive deeper into this variety. Then...the caviar. Tell Drew he is welcome at my house anytime! That looks amazing!